Cockburn mayor Logan Howlett, opposition early childhood and development spokesperson Amanda Rishworth and Fremantle MHR Josh Wilson with Meerilinga Early Learning Program students Senna Hitchcock (4) and Jack Greenwood (3). A GRANT worth $10,000 can go a long way for a not-for-profit organisation like the Cockburn Toy Library. 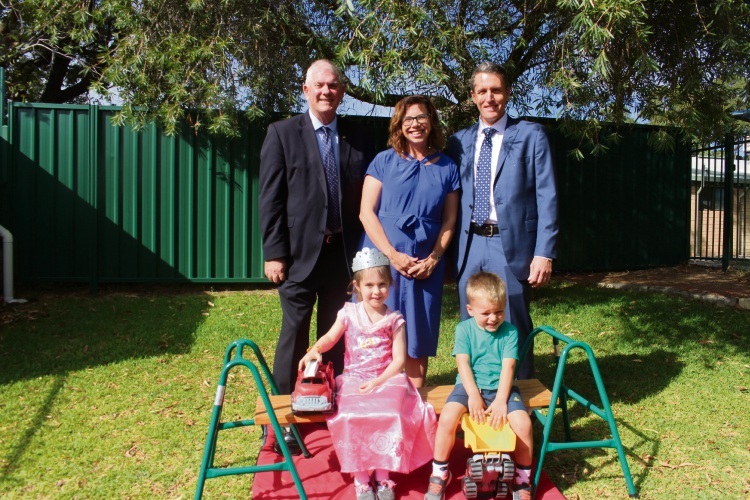 Federal member for Fremantle Josh Wilson and opposition early childhood and development spokesperson Amanda Rishworth visited the Coolbellup-based toy library on Thursday to pledge $10,000 of funding to the facility if Labor won the next Federal election. A spokesperson for Cockburn Toy Library said there were many ways they could put the grant to use, including the acquisition of more STEM-related toys. Mr Wilson said the Cockburn Toy Library was the second largest in the state in terms of membership numbers. “This funding will enable Cockburn Toy Library to broaden its reach to benefit more children and families across our community,” he said.